The weather has become quite seasonal here, after a late flurry of warm weather, and we’re noticing a distinct increase of Cat in the house. 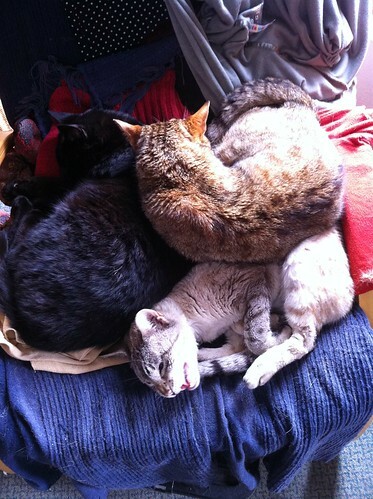 Here is an unseemly heap on the chair in the bedroom, with Mustrum protesting slightly underneath Iggy and Ron. The heap inhabitants remained unchanged most of the day, although the positioning did alter from time to time. There were two cats – Henry and Mustrum – on the bed when we woke this morning, and more cats are predicted in this position. They haven’t actually noticed that the stove is being lit yet, but it’s only a matter of time. Utterly elated to hear that Mustrum is back!! !